Hello, I am new to this site, I just wondered if anyone else have had problems getting charged for entering the congestion charge zone when travelling up Tower Bridge Road, and by Tower Bridge turning into Tooley Street. Turning into Tooley Street at this point can only be done by first turning into Fair Street, meaning turning left just before the junction, and then turn right into Tooley Street and approach the junction from the west. This little trip of about all in all 100 meters cost me £ 60 pounds the other day when I later found out a penalty notice was in my letter box. I can't recall having seen this camera before. Its sole intention must be to tax citizens aiming to take this specific route rather than entering the congestion charging zone. The only alternative for me to get to my apartment, which is in the Shad Thames area is to do a detour eastwards, over Jamaica Road. I don't believe it is reasonable or fair to put a camera at this very location, since people going there do not aim to enter the congestion charging zone in the first place. I will appeal to this penalty charge. If anyone else have had problems or share my views it very be very useful to hear from you. The answer seems to be to head north past the Tooley Street junction, then turn left into Queen Elizabeth Street and left again into Tooley Street. I can see it now, and agree this is a good turn to take. Still though, either turn takes you about the same distance into the zone, and it feels like a trap not having the information that by going another 25 meters you have another just as reasonable turn to take, and this is the "right" one to take. Weird, and definitely feels they just want to catch you once to get that first £ 60 ticket. Both roads are reasonable choices to make, as such since TfL seem to approve of one, they should not discriminate you for taking the other, even more so since the "right" choice comes later, and is a very concealed turn when you are driving along the road, realizing you can't turn right, and as option you will only see the first turn, or (as you can't see the second turn) to continue ahead and cross the bridge. As a driver I embarrasingly have to admit that I never really have thought about the existence of the second turn - although I cross it very often by foot and see the 343 busses go there all the time. I'm glad someone else has highlighted this local council money-making scam. Because, despite living very close to this intersection, I've also been caught a couple of times by this C-charge "trap". 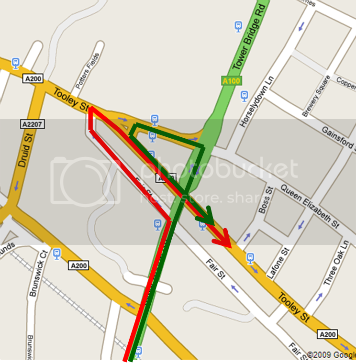 For those that aren't familiar with the problem, the diagram below illustrates the two options for cars wanting to turn from Tower Bridge Road into Tooley Street when travelling north (note: there is no right turn at the intersection). The green route is OK at any time of day. However using the red route 7.00am - 6.00pm weekdays will get you a £120 fine from Boris. Peter O, there can now be few London drivers who have not paid a Congestion Charge fine. The whole procedure seems to be about punishment rather that encouragement. I'm sure it would not be too expensive to send a one-off reminder to errant drivers, who may be mistakenly guilty. However, my point is that you are incorrect in blaming the local authority, Southwark council. The scheme was designed and initiated by Transport for London under Ken Livingstone, the London Mayor. It is now administered under Boris Johnstone. I share your disdain of the arrangement, it would appear to be designed by & for people who don't drive. Hello Graham, I don't actually at all blame the council about this penalty charge, and I cannot see why you think I do. What I do want to understand, and now can see, is if more people share my view that this particular camera point where I got caught is not fairly designed, and its purpose to say the least is murky. I wonder though if anyone has successfully managed to appeal against a penalty at this camera point, and if anyone has an idea how we can get this CC camera moved a few metres westwards, into Tooley Street, so that we can make our turn without getting fined for driving a few metres into the CC zone. I don't think there is a point complaining about it if we do not want to try to change things for the better, and if anyone has an idea how to do this, I am willing to take the lead to get it done. To be fair there are two signs and a Big red 'C' on the road, so having made the mistake you could have just paid the £8. Sticks in your throat I know... I got charged once because I entered the zone less than 1min prior to 6! Well I disagree with you in the first instance that this very part of the road should be a part of the congestion charge zone. That is my point. It is just ridiculous that it is and the turn on queen elisabeth street is not. No one likes paying tax... but it doesn't matter what I or you think about the logic of this street's inclusion, it is in the zone... it is also clearly signed! You had a choice and that was to not turn left off Tower Bridge Road. It has already been pointed out to your that there is a free route! I've never like the blasted scheme, the whole economics of which were entirely based on the idea that people would forget to pay it! I can assure you I'm no fan.